A Thanksgiving table is never complete without a centerpiece. Whether it’s something simple or extravagant, you definitely want it to be unique. 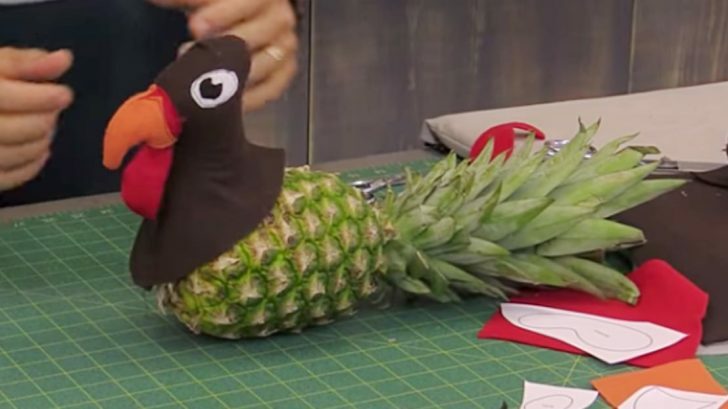 So why not sew up a little turkey from scratch? Rob Appell from Man Sewing posted this adorable tutorial on how to make this cute little turkey from some felt. It’s mainly the head, so he finishes it by putting it on a pineapple. How cute! To get started, you’ll need a pattern to create the turkey. Luckily this printout of the turkey pattern Rob has provided is completely free. If you want to create the body, all you need to do is stuff a round piece of fabric, sew it off, and sew on some felt to look like feathers, but I love the look of the pineapple. It’s so unique! To sew this up, you’ll want to sew the head up, leaving an opening for stuffing, and add the waddle, beak, eyes, and whatever else you’d like. After you sew it up, there will be a little opening to place the body. If you sewed it from scratch, stitch the head on. Otherwise, place it on your body of choice and it’s ready to display! Watch Rob’s tutorial below to see how to do this step by step. Are you going to make this centerpiece? How will you make it your own?